Summer is here! Here we are the last term of the year. Where does time go? We have a busy half term ahead supporting Y6 with their production, lots of work to complete, Sports Week and preparing for the end of term. Hopefully the sun will shine on the Family Picnic. Our English work is often linked to subjects in other areas of the curriculum. We will be using formal and informal language in our written work by learning to write different types of letters and designing leaflets linked to our visit to Herd Farm. The best gift we, you and me, can give our children is the ability to read. Reading gives children independence and unlocks many worlds of fun, imagination and knowledge. Encourage your child to read a whole range of literature as often as possible. Read together. Share books and ideas about the plot, characters and settings. Some good reads and authors! In Year 5 we will be aiming towards most of the children being able to calculate using formal methods. The methods will be introduced using practical resources such as: Base 10, Numicon and Cuisenaire rods. The children can then see practically the processes involved and develop a better understanding of the formal methods and how to record them numerically. This unit is the study of rivers (local and worldwide), how rivers form and how human activities affect rivers. Change of State - reversible and irreversible changes and the effect of heating and cooling on objects. Through this unit children learn that plants and animals reproduce as part of their life cycle and that in every life cycle there are distinct processes and stages. People of other Faiths - In this topic the children will learn about some of the similarities and differences that exist between Christianity and other world faiths. They will have an opportunity to learn about beliefs, behaviour and places of worship. Our class saint is St Anthony of Padua - Patron Saint of lost articles. St Anthony's Feast Day is June 13th. We had a great time at Herd Farm and Year 5 were super! They gave every activity 100% and were a credit to school in all ways - their behaviour, attitude and support they gave each other. Everyone helped out with the dreaded washing up! Believe me - it seemed never ending! I don't think we'll ever complain about washing up at home again! Year 5 were one of four schools invited to an event at the Rose Bowl. 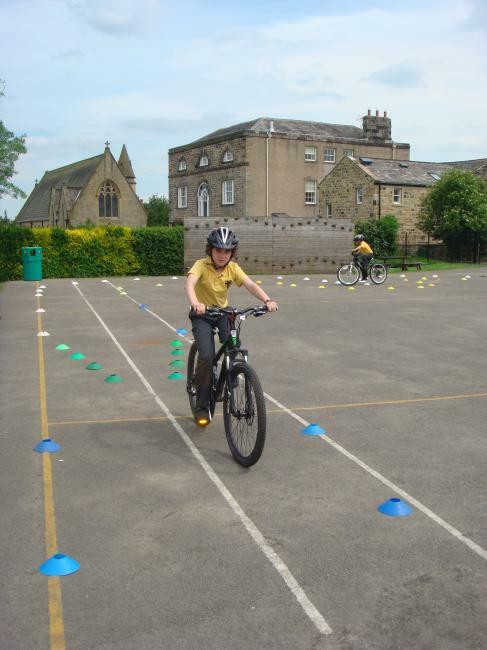 The children took part in four workshops where they looked at different aspects of cycling, mainly focusing on the cyclist. They began by looking at a balanced diet and the crucial foods a cyclist made need before, during and after a race. Next they tried out various activities that tested their stamina, strength, speed and concentration. They then looked at how cycling affected the breathing and heartbeat of an athlete and their own heartbeat. Finally they tested their own levels of concentration and learnt how important it is for athletes to be able to concentrate over such long periods of time. To celebrate St Anthony's feast day we came to school in our own clothes. 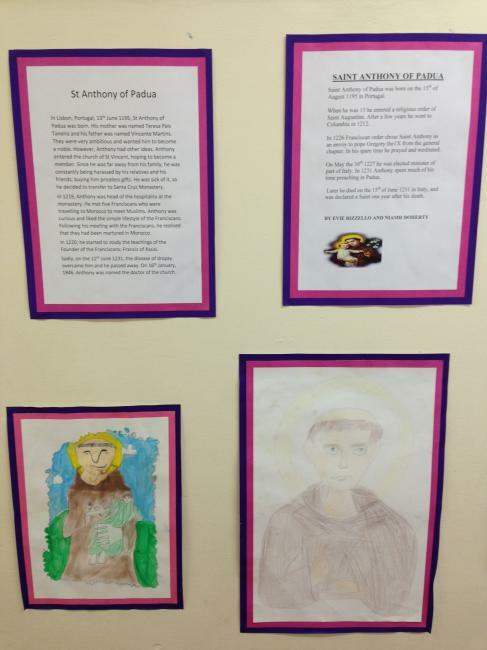 We learnt lots of new infromation about St Anthony. IPC work 'Go with the Flow' - what a super range of homework. 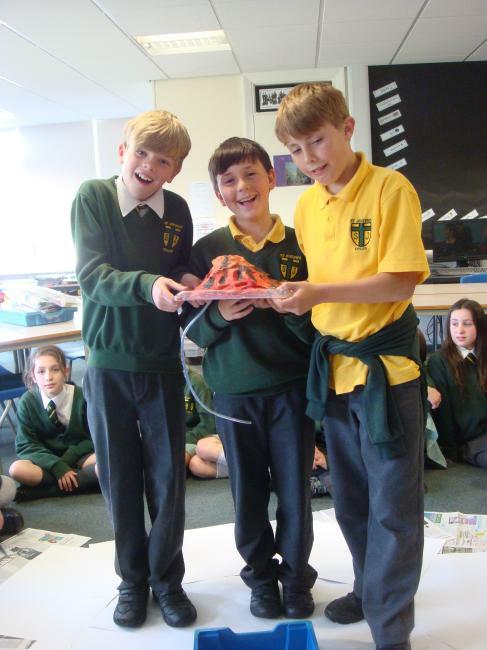 Year 5 were very creative with their homework on rivers. 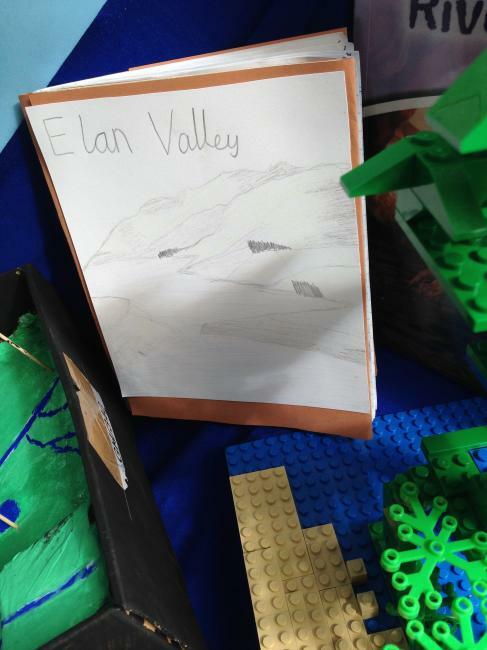 Lewis became a news reporter and used his Ipad to create his own broadcast (soon to be uploaded) and an annotated model of the River Wharfe, Alice made a book on the Elan Dam in Wales, Evie created a tapestry of the River Wharfe, Niamh and Jessica made a model of a river using gel crystals, Pierce built a model of the Tower Bridge, Felix made a lego model of a waterfall, as well as lots of excellent presentations about various rivers of the world. In Maths this term we have learned how to: read, plot and solve coordinate problems; how to use a protractor to measure and draw angles, to draw different triangles and arrow heads and construct pie charts; how to represent and sort data in various ways. We designed leaflets for Sam's Safari. Sam's Safari visited school so as part of our English work we designed leaflets. We analysed lots of different leaflets to look at the content, language and use of imaages. We made our leaflets informative and colourful. 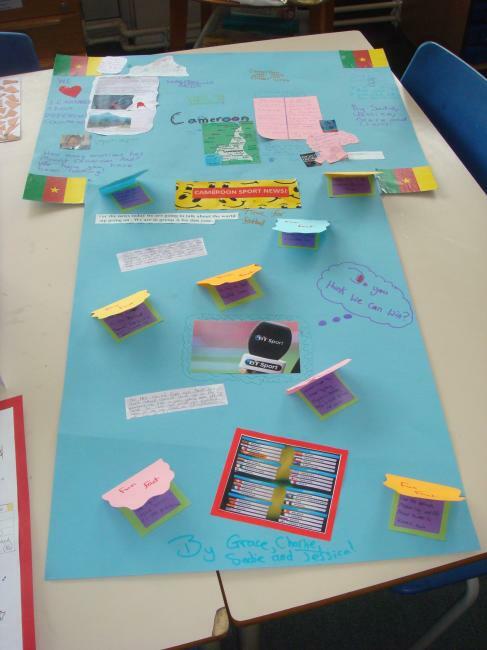 During the week we studied countries taking part in the World Cup and the Tour de France. We placed the countries on maps, found out facts about the country and drew images linked to the country. We used data from the countries to construct pie charts, graphs and to find the mean, median, mode and range. For the Tour de France we studied a racing bike, sketched, labelled each part and found out what each part of the bike does. We brought our bikes into school and negotiated a tricky course set out by Mr Voller. 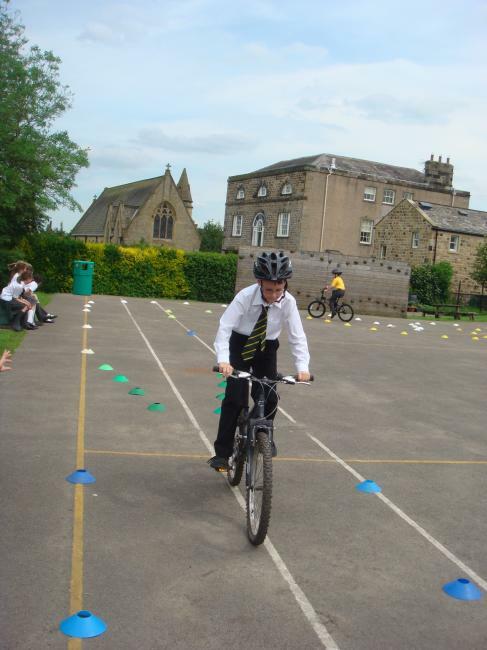 We had to learn to stop, balance on our bikes for a count of four, weave in and out of cones and negotiate tight bends. However, we had fun! Learning Log homework - our Learning Log home was on volcanoes. We could make models, draw, research or make films - the choice is up to us. Here are some of the best moments of Herd Farm. We had fun from the moment we arrived to the moment we left! I do think the class need some practise putting on duvet covers and making beds. Three days went by so quickly. The food was good and the weather even better. In maths we having been learning how to divide using the short method. Using the HTUs blocks we worked through some examples with Mrs Choma. We then learnt how to record our work. In our small groups, using the equipment, we worked through some examples independently! Mrs Choma thinks we did really well. We decided to devote our class mass to Mary because during the Month of May we think about Mary, Our Blessed Lady. During this month we offer up to Mary from our hearts prayer and worship. Fr Lawrie comes to say mass for us. We write our own bidding prayers. Parents, carers, relatives and friends are invited to join us. We had a visit from Sam's Safari. Helen brought in a selection of animals for us to look at and handle. Some of them were very wriggly! Our favourite was the hairy armadillo and the most scary was the snake! Most of us were brave enough to handle the animals. Helen has invited families from school to an open day on June 1st 10:00am until 4pm. As part of our Plant Week, we looked at the different parts of plant. First we dissected a tulip to find out what parts make up a plant. There were a lot more than parts than we thought. We stuck each part on card and then researched the names of the different parts of the plant. Next we drew a diagram of the plant and labelled each part. We worked together to find out the role or function of each of the different parts. Some are quite tricky! Did you know a plant has a male and female part? Can you find them on the diagram or dissections? Evie, Niamh and Niamh made funky jewellery from elastic bands. They were very popular and thety raised an amazing sum of £105. However, they had to start the adding up a few times as they kept forgetting how much they had counted. With a little team work we came up with a strategy. We designed and made masks based on the Myths and Legends we had read in class. Can you spot your child? As part of our Myths and Legends topic we read Theseus and the Minotaur. To get to know the characters better we did some hot seating. We wrote some questions to ask the characters about their actions. Some of the questions and responses were quite interesting! Q Why do you enjoy eating children and not adults? A Because children are young, tender and juicy, whereas adults are old, tough and dry. Q Were you upset when you found out you had been used by Theseus and then dumped by him? A Not at all - there are plenty more fish in the sea. Why does someone as beautiful as me have to worry about meeting someone else. His loss! Q Were you afraid when you entered the maze? A Petrified but somehow I felt protected. I had the shield and sword given to me from Ariadne and of course a way out. I was determined to defeat the Minotaur. Q Did you use Ariadne? A Yes and no. I knew she liked me so I went along with it because I needed her help. If I had told her how I felt I knew she wouldn't help me. I did keep my promise and take her away from her mean father. It wasn't quite what she expected. As we know she does rather like herself. Our class focus for Otley Week was maths. First we used the outdoor environment to identify different shapes and symmetrical patterns. Our next task was to visit Otley Bridge to look at its structure. We sketched the bridge which had seven arches. Back at school we were set a challenge to recreate the bridge. The bridge would be judged on how closely it represented the real bridge, team work, strength (had to hold at least 1kg weight), budget (£10 budget to buy resources to build the bridge) and built within the given specifications (height and length). We had great fun building the bridges but more testing them. At times it was tense! Our focus for Black History Week was Walter Tull. Walter Tull, was an orphan born in Folkestone in 1888 to an English mother and Barbadian father. He played for Spurs before joining the Army. He rose through the ranks - despite Army rules stipulating officers had to be "of pure European descent". But here's the injustice: he was recommended for a military cross, but for whatever reason, he never got it. Michael Morpurgo’s book A Medal for Leroy draws inspiration from the remarkable story of Walter Tull, the first black officer in the British Army and one of the first black players in the Football League. We had a fun time and even adults can behave like children! The school was over run with robots. Our homework for the holidays was to design and make a robot. There were some spectacular robots. Obviously a lot of care and attention went into making these robots. During Robot Week we designed maths games with a robotic theme. We played each others games. They were fun yet stretched our mathematical thinking. Mrs Thomas came into school to read us one of her favourite stories - Esio Trot by Roald Dahl.